It's not the reasons you might think. While the content of the cut scenes in Prince of Persia is a bit ... contentious, it's not the content, but their presentation that I find so problematic. If you haven't played Prince of Persia, these conversations are triggered by the player pressing a button and play out like this (which is even funnier in German). A large portion of the game's story and character development is delivered this way. The problem with these cut scenes is every time you want to watch one, you have to stop playing the game, and worse, there's no reason for this to be necessary. Had the story and the gameplay not been mutually exclusive, I think it would have been much easier for players to engage with, and consequently enjoy, this world that a team of designers and writers worked hard to get you to care about. By and large, I am not fond of cut scenes in games. I can make an exception for some introductory videos, as they can communicate important things about the game before gameplay begins (e.g. Left 4 Dead's intro is the tutorial1, while the intro for Dawn of War immediately communicates the game's essence and aesthetic). Any cut scene beyond prologue/epilogue is problematic, but at least there's usually a justification for it. 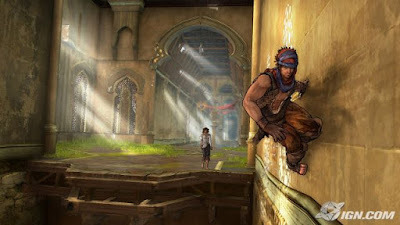 The optional mini-cut-scenes in Prince of Persia do not have that justification and could have easily been executed without interrupting gameplay. The value proposition for normal cut scenes is that in exchange for temporarily not being able to play the game, you'll get to watch an interesting moment. Maybe it's a series of animations too complicated to be available in-game, a dramatic pan that moves the camera in ways the player can't, interactions with the environment the engine can't support or just fancy pre-rendered FMV. The dialog cut scenes in PoP grant none of these things. Every time you press the dialog button to converse with Elika, the game stops completely. You're forced to cease the (admittedly quite fun) platforming gameplay and just watch. And visually, the mini cut scenes are supremely boring. If they were translated into a storyboard, it would consist of two shots: one of the Prince, one of Elika, repeated ad naseum. The Prince has a few one-liners that don't halt gameplay. I cannot comprehend why the dialogs with Elika must force the player to watch the same scene over and over. I can't imagine there being a technical reason for it. Cognitively, I don't think there would be a burden caused by playing and listening to the dialog at the same time. If some players did feel overwhelmed, they could simply opt to stand or perform simple actions in the environment while they listen. Plus, missing a conversation can't be that bad, as it's possible to play the entire game without ever watching a single one. Don't get me wrong, I like that they're optional and the player can choose their level of involvement, I just don't understand why the decision has to be between playing and engaging with the story. There have been some less than favourable reactions to the characters in Prince of Persia and I can't help but wonder if (consciously or subconsciously) this is partially because the player is constantly being punished for wanting to know more about the story. I think most people grow tried of constantly having to halt gameplay and just avoid the optional cut scenes. There was a study linked by Gamasutra not long ago that showed players reacted more favourably to dialog delivered in-game (and to traditional cut scenes, which could still be present in Prince of Persia, whenever a new area is reached or a boss Corrupted is encountered). I'm quite enjoying the actual gameplay in Prince of Persia, but this issue is significantly impeding my ability to explore the game's story. Why must we be forced to decide between playing the game and learning more about a plot and characters? Especially when having both would have been so easy. - There's a fantastic article on Left 4 Dead's developer blog about how they created the intro. I highly recommend reading it. I think the reason the dialogue sequences are not presented during gameplay is that every time the player engaged in combat or needed to be rescued it would potentially interrupt the dialogue sequence. Each dialogue sequence would require additional lines to reference the fact that the player nearly died in the middle of it, or they would have to stop at that point and pick up again after as if nothing had happened, or stop entirely. The first would require a lot of additional work and the other two would seem very strange and probably serves to highly the break between gameplay and narrative even more. As it is some o the dialogue doesn’t trigger the explicit cut away and so can be listened to while playing. 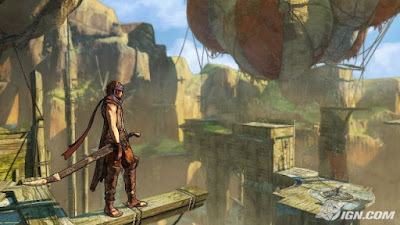 Although I still haven't got to play the new Prince of Persia, you have certainly articulated many aspects that bothered me with so many other games that utilize the same hindrances. For starter, the halt of gameplay to progress the dialogue with a push of a button puts off many RP-Games in a state of “wall of texts” punishment. Of course, narrative is something important in most RP-Games, but when it is not presented within the frames of the usual cut-scenes, it somehow feels sluggish and deviant. For example, one of countless facets that made the cut-scenes in Final Fantasy X quite enjoyable for me is that they were presented in smooth, uninterrupted scenes. You are no longer pushing the button in order to advance the storyline and the communication between the characters. It does that for you, to the fact it feels like you are watching a proper scene. Obviously, the lack of such utilization is understandable for the RP-Games of old, but there is no excuse to persist on exploiting the in-game animations for cut-scenes nowadays. I also favor your observation in how sometimes the game punishes the player to know more about the characters and/or the story. This is quite true in most Tales series. To be more specific, most Tales games utilize a feature called “Skits”. These skits are totally optional, and you can trigger them on your whim whenever they become available (click HERE to witness one for yourself). Most of the time, these skits provide the player the opportunity to understand the characters, and the circumstances that surround them. Some are quite enjoyable and amusing, and others are complete torture, especially those bland chattering that occur among the characters where they just recap the situation and end the skits with “OK, enough with the chitchat and let’s move on”. Although, I have to admit that the latest entries of the Tales series have few of these atrocious moments and there have been some improvements on handling these skits. And finally, I just want to exemplify some of the games that thoroughly illustrate your concluding question. Games such as BioShock and Metroid Prime series where the environments tell the story, and the cut-scenes are presented with seldom amount of interruption. And the freedom to pick up the logs and the radio dairies, and to listen to them at your leisure is a remarkable execution on handling the cut-scenes within the genre of the first-person shooter/adventure. Let’s hope we get to see such clever implementations in the future. This really irked me too. It's a real concern to me, that so many critics are either okay with this, or haven't brought it up. It's sending the developers the wrong message, and it continues a tradition of unnecessary rules over how we are presented with stories in games. I'm sure your reasoning was the same reasoning the developers had for doing things the way they did, but for me thats no excuse, it's just lazy. While your right that having the dialogue sync up with deaths would require a lot of work, I still feel it's important enough for either committing to making it work, or at least brainstorming a workaround. Just off the top of my head, how about limiting the dialogue sequences to outside of combat by working the limitations into the dialogue itself, Elika could grab your hand and express her need for you to hold up a moment, ofcourse this would need to be mixed up to be more natural. @CrashT Is it really that much of a problem though? It's simple to add a flag to each line of dialog to indicate whether or not it's been completed. If it gets interrupted, it replays when the player pushed the dialog button (perhaps with a little "You were saying?" line proceeding). It may be a little jarring, but I think it's vastly better than subjecting the players to, in aggregate, one to two hours of completely passive "game" just because they're interested in the characters. If a player finds this offputting, they can always remain stationary. I just find myself incredibly frustrated that I'm being asked "Do you want to play, or to you want to know about the characters? You can't have both." @Angelo I remember those scenes in Tales of Symphonia. They were also bothersome, but at least where was some uniqueness in the animation of those scenes. With PoP, it's just the same scene every single time, which means they're basically only audio information. The execution of audio content in Bioshock or Fallout 3 is, as you pointed out, far more enjoyable that being forced into idleness. @enandrews I've been avoiding a lot of discussion about PoP since I haven't finished it yet and there's a lot of commentary about the ending. But I haven't seen the issue about the actual interaction (or lack thereof) with the optional dialog being called out much. Maybe lots of folks are just used to it. I'd be grateful if someone count point to other folks looking at this issue though. Thanks for stopping by and commenting guys, I always appreciate the discussion. I'll concede that I was making excuses for it, but maybe I'm in the minority as I had no problem with those sections. They didn't feel like I was being punished for taking an interest, like I was required to stop playing to learn about the story. They felt opportunities to take a breather and reflect on things. Often that was pleasant especially if I’d been running around for a few minutes beforehand. The examples of Metroid Prime and BioShock brought up by Angelo are misleading as those titles already have moments of quiet built into their gameplay which player will naturally fill with exploring the environment or listening to audio logs, Prince of Persia rarely has such moments so taking an explicit break to experience the story makes some degree of sense. Reading your complains again I’m left wondering if you main problem is that they the cut-scenes exist or that they are simply bland, badly shot cut-scenes? @CrashT Thanks for following up. I've got a tendency to ramble, so I'll try to keep this condensed. I don't like cut scenes in general, but if they must be present, they should be as useful and interesting as possible. PoP's fail to do this since they really only present audio information (I understand why they didn't uniquely animation each; too much time needed). I'd be delighted if I count fill the game's more repetitious sections (searching for light seeds after an area has been purified) with these conversations instead of being forced to choose between watching them and enjoying the platform-y goodness. I really wish that the designers had stuck with the tradition they staked out in Sands of Time, because I thought that game did a remarkable job of integrating dialogue and narrative elements into the game without being obtrusive. Why couldn't your two protagonists spar verbally as they dance across the landscape, as they did in Sands of Time? The way it is now the cutscenes are short but they almost feel like a punishment. They make you interrupt the gameplay and come to a dead stop. All this would be less objectionable if they hadn't hit on such a great formula in the first game. I think a lot of the issues I had with the most recent PoP were because I couldn't help comparing it to Sands of Time. By itself, PoP is solid, but I was always thinking about how Sands of Time pulled off $X just a little bit better. I will say that PoP's combat could have surpassed SoT's. It didn't, but late in the game I realized that the combo-based combat was a natural analog of the run, jump, grab platforming. The execution was too rough, but had they pulled it off, PoP could have soared in this area.